I know this week has focused on food, but I also enjoy a good beer when consuming food or hanging out on my deck during the summer evening. 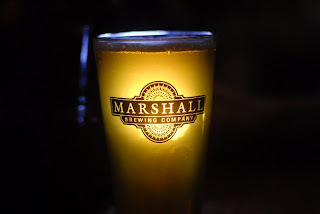 In Tulsa, we have a micro-brewery-- Marshall Brewing Company -- that bottles beers. Atlas India Pale Ale and Sundown Wheat are my favorites, and Kevin is also a fan of the Sundown Wheat. Not only is Marshall bottled, but it is served in and around Tulsa, so when we dine out, we can enjoy a high quality local beer! I will try Marshall if I can find it around here. Love that you love good beer. We can be beer snobs and stroller snobs. I love me some Marshall Beer!